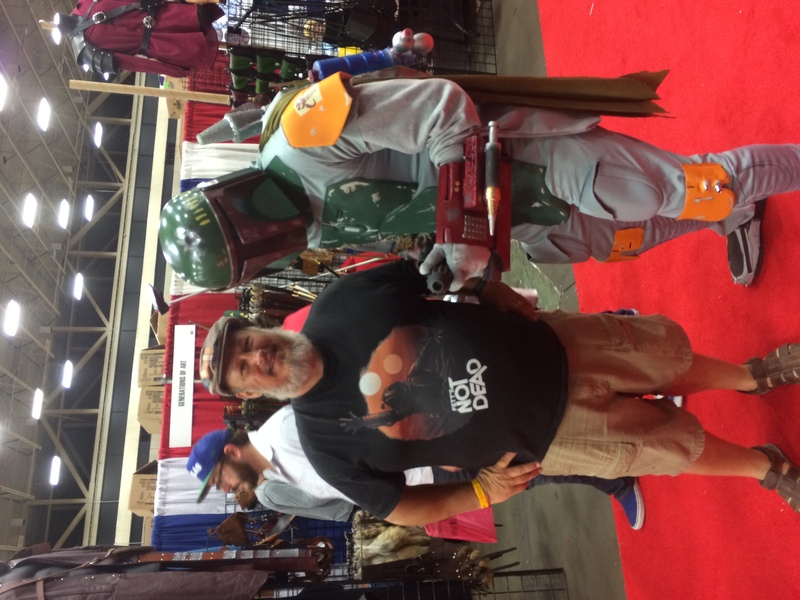 Today was Dallas Fan Days (aka: Comic Con) - but I'll get to that in a minute. Let's do a quick Weekend re-cap, shall we? 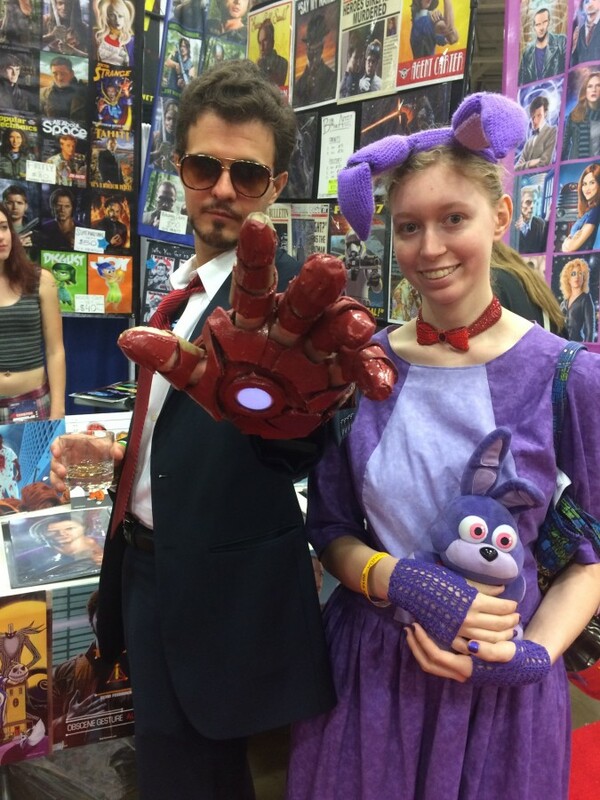 Now, to *normal* people, this looks like a girl with a guy cosplaying as Tony Stark. 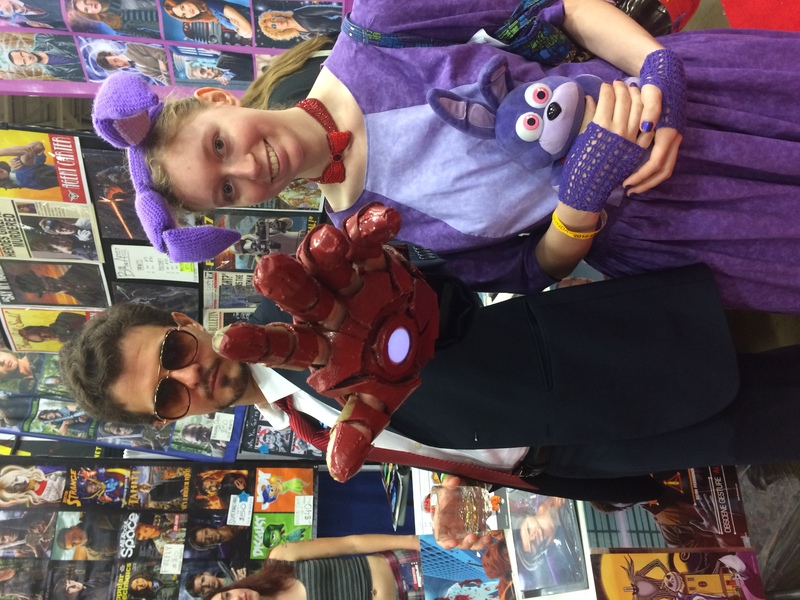 What it actually is, is my Aspie squee-ing over getting her photo taking with TONY STARK. She actually asked me to ask him - this is a first. She is STILL giggly over it - and the photo was taken around 11:15 this morning! She also happily posed for photo-ops with kids who recognized her costume: Bonnie the Bunny from Five Nights At Freddy's (aka: FNAF)(Don't ask, if you don't know. Basically, haunted robots at Chuck-E-Cheese's. )(trying to kill you). God is GOOD, people! I thought - according to all the paperwork I had - that Herself was not getting a SSI check this month. It put me in a small panic - because Himself's check pays the house, the car and house insurance, and the electric bill (most months - electric fluctuates! ), her check pays everything else. I did the bills this AM, expecting *1* deposit - we got 2. :scratches head: I put a call in to the "local" office...seems that SS is 1 month BEHIND. So, THIS is her last check. AND I got a call from the state disability office - they just NOW started working on her claim. :fingers crossed:.....I really, really hope it goes thru without a hitch. SS wanted to speak to Herself (since she's 18 now)...and she Freaked OUT. She doesn't do well on the phone.....or with people she doesn't know. 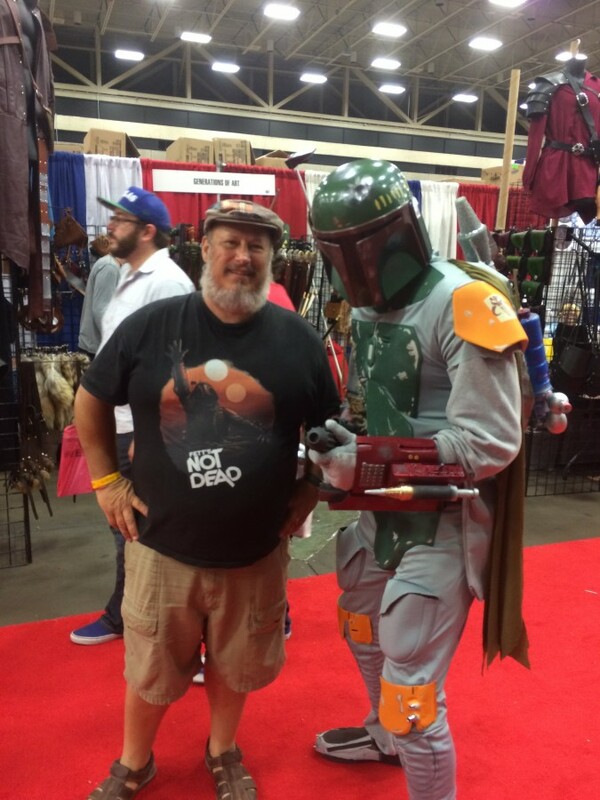 (Funny story: we took SG's dad out on Saturday. He and I got to talking about the kids, and I dropped something about Herself being on the Spectrum. He said "Oh. I had no idea...I mean, yeah, she's always sitting over there, doing stuff...I just thought she was shy or something." I chuckled...."Um, no - she was with family, and that IS her being social. You should watch her when we're out and about sometimes - she doesn't interact with anyone she doesn't know. You? She knows you're "family" but doesn't KNOW you, so she's in the room, but not IN the room, y'know? Once she's......."safe" with you, she'll start talking to you - and you'll wish she was back to today. :lol: Because....YOU don't pick the topic, and YOU don't control the conversation. It's...interesting." Anyway.....gotta go round up Tigger. Laters! Let's see.....took Herself to a new phychiatrist today -I like him. He specializes in ASD kids (which I didn't know when I made the appointment - Thanks, Yah!) and - get this! - believes in the "less is more" approach to medications. He took her off EVERYTHING except Vyvance, and added 1 - yes, *1* pill. Very easy to talk to, tried to engage Herself (wasn't happening), and suggested Social Therapy. Which I've been trying to get for YEARS. I think this is a good move. Gotta get ready for Shabbat, so more on the flip side! Last night wasn't too bad...this morning? I swear my children have been possessed. Herself woke up surly, and stomped out to the garage. She was ticked that she had to wait on the rest of us....Himself was slow to start. We get to the barn - Herself busys herself with feeding the horses, then goes back to the house; Himself helped me milk while G'ma fed the babies. We get done; Himself goes in while I feed the now starving (and about to *die*!) goats. I get in the house, and Himself informs me that Herself said something about "his a-word". OK..I'm tired. I don't *need* this...I pop off "Well, it's cute - what of it?" :bangs head: NOT the right thing to say......:sigh: He proceeds to tattle - which is NOT allowed in my house. She starts denying it.....and turns on the tears (I think that's an Aspie thing - she doesn't get social things, she's seen some li'l girl cry and get comforted, so, Hey! Tears!). And I haven't DONE anything. :bangs head: I tell her, fine - DON'T Say things like that! which, again, she denys that she's done, and cries, and I'm thinking - hey, I didn't yell, I didn't use my stern-parent voice...what the hell is going on here? I tell Himself to stop it - and HE starts crying. WTH???? I quit....I had to get dressed for work (lunch today at the :sniff: Petroleum Club :sniff:) and did NOT have time for this. This is NOT typical of my mornings, and it's NOT typical of my children. Sniping at each other? Yeah. Tattling? Not so much. Crying over NOTHING? Not at all. Herself's new councilor called today (!). She wanted to go over the 504, and to ask if she could make a change. The 504 states Herself needs to go to a quiet area upon arriving. The councilor suggested that we try her in the cafeteria with everyone else, since in 2 years she'll be in HS, and...well, that's how it'll be. :sigh: I agreed. She also agreed to meet with Herself and G'ma next week when they pick up schedules; she will take Herself on a tour and get her settled. Since she and Herself knew each other 2 schools ago this should work out *great*. And, I get to meet with her after G'ma's surgery. It's been wild today, so let's get with it, shall we? Basically, Herself is to be allowed to do stuff with her hands (origami, pipe cleaner sculptures, stress balls, ect) while in class. She is to be helped with organization; she is NOT to take assignments home(because they'll never be seen again), she is to be given structure (VERY Important for an Aspie! ), and she is to be warned of changes in routine. They are recommending AP classes - which I already suggested - and I hope it works. THEN, we went out and picked up my new pullets - my very sweet husband got me 8 2 month old Silver Laced Wyandottes! They are cute, and silly, and will make a colorful addition to the flock. (Pictures will, of course, be forthcoming). I spent the afternoon watching them adapt to the flock, and putting down new chicken wire around the 2 sides of the perimeter of the run. And mowing. I'm glad we got new pullets...1 of the RIR's isn't looking too good. I think she may have been hit by a rock while I was mowing - she's acting kinda drunk, and sorta fell over in the coop. :fingers crossed: that she's just a bit stunned....then we have a Buff Orp that's been sitting in the nesting box all day - no egg, though. We're watching her, too.....:sigh: That's part of country life I don't like, but it's part of nature. I need to do one more side of the run (the 4th side still needs to have the posts reset), then I need to shower and take everyone out to dinner. I'm tired! The saga continues: Sweet Geek called the counciler yesterday, and..she basically sluffed him off. To the point that he said "F-this!" and called the Austin Headquarters. :evil grin: He's waiting on a call back - which I am sure he'll get.